LamiDesign IBU Building System - an advance look Our first graphical demonstration of our modular system for creating IBU based houses. Earlier this year we created a multi-unit housing proposal based on 40ft IBU units for a design competition. The images and competition boards were posted in the blog here. At that time we explained that the system shown in the competition entry is the same system of modular parts that would enable larger housing units. We have been hard at work formulating and extending the design of the system to that end and we want to take this opportunity to introduce how it is going to work. The basic approach is to create large open plan living spaces defined by servant space in load carrying IBUs at the perimeter. In this way activities that can tolerate the rather narrow space of the IBU make best use of the space they provide - sleeping, bathing, kitchen work space, and the resultant open space between them provides natural relief from the smaller spaces and comfortable and flexible living space. Now the system is not a series of house designs per-se, but rather a series of modular building blocks that will fit interchangeably into a general house schema. To demonstrate I've developed a house plan based on a 3 box schema. This was chosen because I've shown sketches of this configuration before, once in my essay about IBUs, and a 2 box variation in a multi unit stack in another post, a two story configuration of this house scheme was also used in one of my modern house cartoons. It was also chosen because it makes a small, compact, yet very livable modern floor plan. A good starter home, or weekender for those in a position to have one. 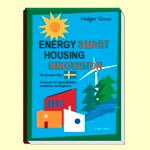 It is also suitable for multi unit buildings as well. It seemed like a good place to start. Here is the floor plan of a basic 3 box schema. It contains 3 bedrooms, two full baths, kitchen, and open living room. This house nets out at just over 1000 sqft. The bedrooms are very small by today's standards. The bathrooms are as well - 5x7s as they are known in the industry. Yet the living room at 20ft by 24ft is larger than what is offered in many larger homes. This small house will live larger than its size no doubt, but the proximity of living space to bedrooms will not allow you to escape the fact it is a small home. But this one layout is only the start. We intend to offer a small range of modules with slightly different configurations in order to allow you to find a combination that best suits your needs. 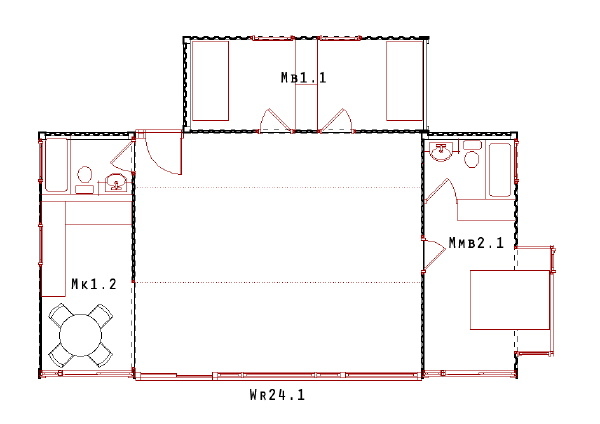 In the image you can see there are 3 different Kitchen modules shown, and 3 different Master Bedroom modules, and 3 different modules for secondary bedrooms. These units can be plugged and played to create new variations on the floor plan, albeit subtle variations. However 2 box variations on the schema are possible for even smaller 1 or 2 bedroom homes, or 4 box variations which can create 4 or 5 bedroom homes. The depth of variation that these modules introduces grows quite quickly. 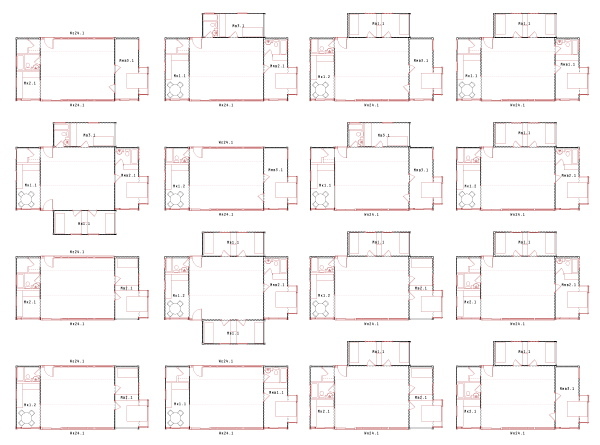 Below we have shown 16 floor plan variations of the 24 which we quickly came up with. I am sure there are many more that have not occurred to us yet. 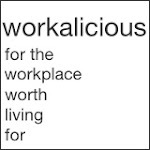 We expect our customers to surprise us with the variations they bring to the table. We will expand on this in future postings. We have larger house schema to show you. What we don't have yet is a clear path from here to your local IBU house store. Close advisors have told us: Don't let that stop you. Move the idea forward and the best method of delivery will emerge in the process. We are following their advice. Wow, Greg, really exciting stuff. Would you mind having them ready for my first house?! I'd like to see what you do with stair unit (turning a container on end). Matt, I think you will be able to get one in a few years, if not sooner. And if not my designs then somebody elses. Container guy - I'm afraid you won't see me putting a container on its end. Remember these ISO boxes were not designed to bear loads on their ends. Sounds like trouble to me. Stairs will happen in the in between spaces in my designs. found your blog via boingboing.net - nice work. Question - how are these units being insulated, both from heat and cold. The IBU vendor SG Blocks uses Supertherm. You can google that if you want to read more about the properties of this insulation. Also here via BoingBoing. Wondering if you had thought of designing outdoor space into your layouts. Do you mean as in a home that forms a courtyard? love the ideas you got going. I'm located in the pacific northwest and moisture control is a big issue. how do you handle moisture? What is a typical wall section?